Happy Valentine's Day from The Album Room! The 14th February is a day for our clients to appreciate and celebrate their individual love stories. Naturally, we at The Album Room were inspired to share with our clients a few fun facts about this day dedicated to love. Love is in the air! It's estimated that about 4 million Americans will get engaged on Valentine's Day this year. More than 100 million roses are sold at Valentine's Day. Of those 100 million roses sold 73% of those are purchased by men. We all have heard the phrase “wearing your heart on your sleeve”, but the phrase has actually come from the middle ages, when according to a popular tradition, young men and women would draw names from a bowl to know who their valentines were and then they would wear that name on their sleeve for the entire week. Nowadays, we commonly know that "to wear your heart on your sleeve" means to not be afraid to show your emotions. Thank you to Craig Paulson Photography for lending us a few of your favorite moments! We wanted to share a lovely testimonial we received from our recent clients Susan and Derek. Susan used our Assisted Design Service and designed her family a one of a kind wedding album and gave it to her for Christmas. We thoroughly enjoyed having Susan hang out with us while designing her album. Susan designed a 12x12 Vogue album with a gorgeous black silk cover. The Album Room team was very helpful and guided me in making a BEAUTIFUL wedding album in record time! I chose the DIY option and enjoyed putting the photos together in the album (and there will be someone there with you if you need any help). There are limitless options to choose from (material, size, number of photos, layouts) so that you can create the perfect album for yourself. Thank you for making it a wonderful experience overall. I will be back to make more albums! Happy One Year Anniversary Marcie and Eric! Marcie and Eric loved their gorgeous stationary designed for them by Cheree Berry Paper, so they wanted to prominently showcase it in their wedding album. They choose our Fusion album to timelessly displays their stationary, framed by custom designed black and white mats. The Fusion was a perfect combination of classic elegance with a modern element that accentented their wedding seemlessly. Marcie and Eric's wedding was photographed by Karam Puri Photography. 'Tis the season to be merry. We wanted to share with you our most recent festive holiday albums that have just arrived. Now, since our clients haven't actually seen them yet we are only giving you a sneak preview of the beautiful leather covers. China's mum, Kiendl, chose the rich poppy red.. we so want to show you China's dress but you're just going to have to wait until the new year. Tim's mother chose the timeless white leather with gold embossing, with a contemporary twist … the images are flush to the page! The Jorgensen Vogue totally owns white leather. We can't talk too much about Catherine and Trey's divine silver buckram Fusion album as one of our favorite photographers, Courtney Dudley, is traveling home to Texas tomorrow to surprise them with her gift. Thank you to all our wonderful clients, friends and family for making The Album Room's first year in business such a success. Happy Holidays and we look forward to sharing some good times in the New Year. Jorgensen's Styla Album is one of our most loved albums. This album has been a favorite this summer and has recently been featured on Style Me Pretty - one of the hottest blogs in the world of weddings. This chic matted album appeals to the modern couple who still wants that touch of classic elegance. The Styla Album is bound in a unique way that allows the pages to lie flat. It’s a sleek and contemporary way to showcase your wedding photographs. 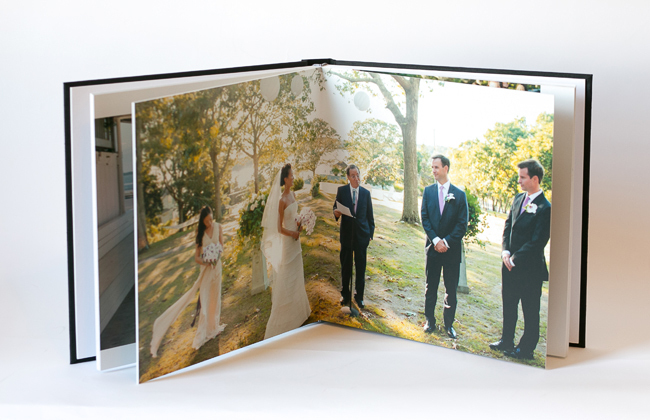 Each album is individually designed - allowing you to customize your album to compliment your wedding photos. 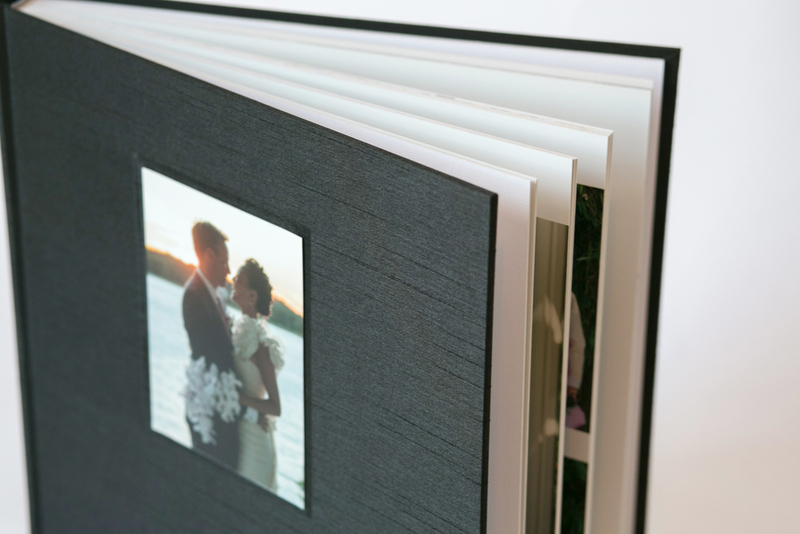 The Styla's matted album offers a variety customizable options; making your album one of a kind! From photo covers and embossing to custom page corners. Every image is elegantly framed by its own custom designed mat. The Styla comes in 7 different size options; including both square and rectangle. Which can be bound vertically or horizontally to suit every clients personal style. If you're a photographer interested in offering this album to your clients or a couple needing that classic yet modern album to tell your love story. Give the ladies of The Album Room a call! Our studio is located off Union Square and would love to have you drop in and see our albums! We are really excited about showing off our new studio album from Jorgensen. The Fusion album marries together two very loved album features, mats and flushed digital pages. The classic, timeless wedding album meets the contemporary, sleek magazine style. We couldn't think of a better couple to showcase this album than the ridiculously stylish Nathalie and Steve. It was such a pleasure designing this layout. The Album Room has recently introduced the Do-it-Yourself option, which has been a huge hit with our clients. Lets face it New Yorkers know what they want, so who better to tell the story of your own wedding than you. Plus you have all the bragging rights as "The Designer" of your wedding album. In addition, you receive 25% OFF the base cost of your album. How it works: The ladies in The Album Room schedule a time for you to come by our Union Square Studio. We have your pictures loaded into our very intuitive software with pre-designed templates allowing you to create your album with a simple drag and drop of the photo ...Not tech savvy, no worries, a designer will be at hand for any help or a professional opinion. We are devoted to making the entire process quick and enjoyable. We also offer the Full Service option where we design the album, but you can view online and instruct us to make changes to your layout until the story of your day is represented perfectly. We look forward to working with you. We are so thrilled with our feature this week on Style Me Pretty New York! Plus you have a chance to win a $100 towards your Wedding Album! Check it out... Style Me Pretty Feature !!! Here is how to get in on the action.... Stop by The Album Room website ASAP and tell us in the comments below which one of their album styles is your favorite to win a $100 voucher toward an album. The winner, chosen completely at random, will be announced right here on SMP on May 10th. Good luck! We spent the whole day photographing our new studio albums! Thanks to Craig and Courtney from Craig Paulson Photography for helping out. We'd love for you to stop by the studio anytime to browse through our recent albums. Keep posted for these images on our website in addition to a blog features of each of our new albums. We were recently gifted a beautiful print of Allen Ginsberg from our great friend Wyatt Counts. Our studio in Union Square was the location of Allen Ginsberg and Associates up until his death in 1997. This print of Allen in his apartment now hangs by our front door. If you come to the studio you will notice his name still graces our threshold as the building has not removed it since he left 15 years ago. We're honored to share our door space with such a talented poet! The transformation of our space is now complete! Our final addition, a mid century coffee table, adorned with some beautiful anemones from the Union Square Market, gosh its great to have the market so close. It's starting to look like Spring! Carrie was our first bride to try out our DIY service and, boy, did she make it look easy! She nearly put us designers out of a job. Carrie spent no time at all becoming familiar with the software and as she knew her pictures better than anyone, she told her story in less than 3 hours. Thank you Carrie for sharing your day with us. Our youngest album designer, Maximo, and his mother Janet stopped by The Album Room today to make some final adjustments to Maximo's Bar mitzvah album. Not only did they share their valuable creative input but also a great Australian musician that was new to us, Gotye. Thanks Maximo for keeping us cool .. Gotye's been on loop since you left!